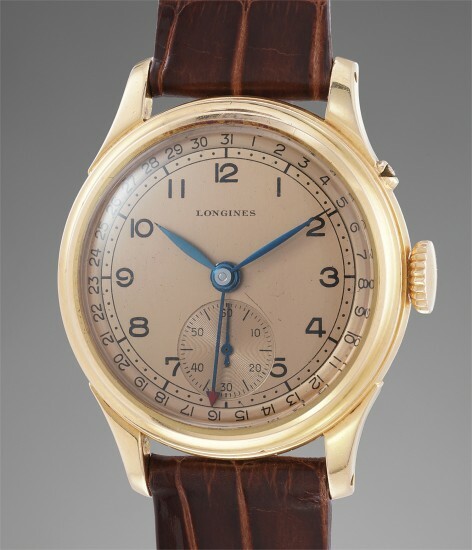 Nicknamed “Pointer Date” due to its red tipped hand pointing at the calendar printed on the outer ring of the dial, Longines' reference 5412’s resemblance with the extremely popular oversized time-only from the 1940-1950s is striking. With a case diameter of 35.7mm, the watch is not oversized but its presence on the wrist remains very satisfying. In production for a very short period of time in the late 1940s, the reference was mainly available in stainless steel. This very short production makes it extremely difficult to find an example today, but the chance to find one in pink gold with a pink dial is even smaller. Further presented in excellent condition this watch represent a scarce opportunity to own a reference that only a few savvy collectors would know.